Path MEGAzine > News > Gospel > The Alliance (formerly The Gospel Announcers Guild) Will Continue Kenny Taylor’s Tradition at G.M.W.A. 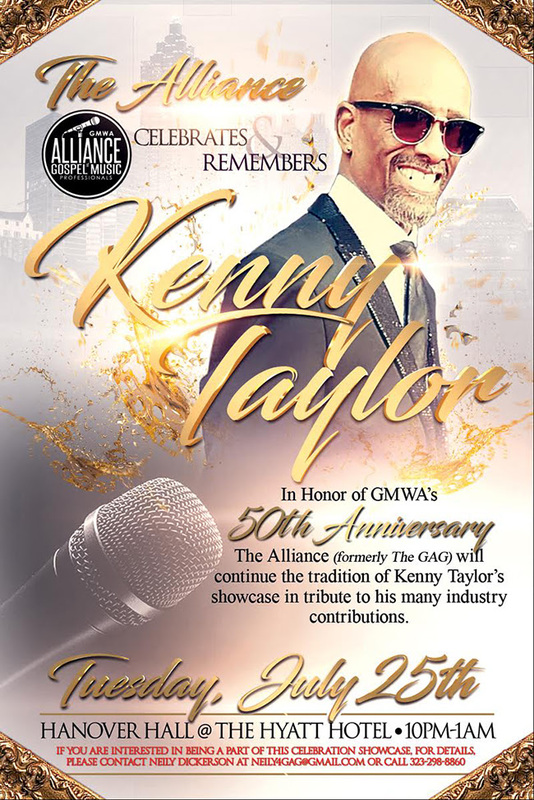 The Alliance (formerly The Gospel Announcers Guild) Will Continue Kenny Taylor’s Tradition at G.M.W.A. The Alliance of Gospel Music Professionals (formerly known as the Gospel Announcers Guild) will continue Kenny Taylor’s flagship event that he sponsored every year at the Gospel Music Workshop of America. The Alliance has decided to continue Kenny’s mission of getting Gospel artists exposure by holding the event in his honor on Tuesday, July 25, 2017. The Gospel Music Workshop of America (GMWA) will take place in Atlanta from July 22-29. Famed industry executive Kenny Taylor passed away recently, and his loss was felt in every circle of the Gospel community. He was someone every executive behind the scenes knew and enjoyed. Kudos to the Alliance for continuing his event, and I hope they permanently name the event after him! This entry was posted in Gospel, Reviews and tagged GAG, GMWA, Gospel Music Workshop of America, Kenny Taylor, The Alliance, The Alliance of Gospel Music Professionals by Kris Patrick. Bookmark the permalink.